A bathroom is often used to freshen up. Perhaps it deserves a makeover too. ProSource® of Dallas Market Center is proud to offer a wide range of bathroom remodeling products, such as faucets, sinks, showers, toilets, tubs, and vanities. Plus, our design staff stands ready to provide professional advice on how to best update any bathroom. Bathroom sinks have transcended beyond just the drop-in models of the past. Today, you can find sinks made from fireclay, glass and marble, that can be installed above and below the counter. 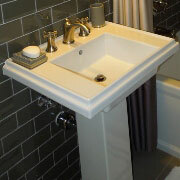 For a stand-alone look, browse through choices of pedestal-mounted sinks. 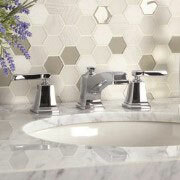 Sometimes taken for granted, the sink faucet should never be ignored during a bathroom remodeling project. Beyond just moving water, faucets are part of a bathroom’s decor, and the impressive assortment of finishes, brands, and styles ProSource offers means that you can find a match for any sink. The shower can be more than a spot to cleanse – it’s can serve as an escape from daily tribulations. Whether the desire is functional or a spa-worthy retreat, look to ProSource. You’ll find the shower bases, doors, handles, and heads needed to make a remodeled shower stand out. A vanity provides any bathroom with much-needed storage and counter space, while also providing another medium by which to tie the space’s designs and decor together. 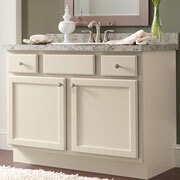 Select from a bevy of styles, sizes and colors that match the remodeled bathroom’s personality. 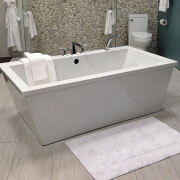 Soak up the numerous choices of bathtub styles available, from traditional clawfoot to modern options. Regardless of a the bathroom’s size or layout, you’re sure to find a tub that meets any functional need or design aesthetic. 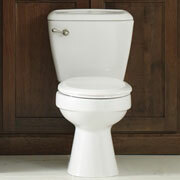 While a toilet is one of the most utilitarian fixtures in a home, it doesn’t have to appear that way. At ProSource, you’ll find toilets in any number of colors, styles, and water flow options. Ask about our eco-friendly, water-saving models that are sure to please your budget. We proudly serve Dallas, Carrollton, Farmers Branch, Richardson, and Plano, Texas. The ProSource of Dallas Market Center showroom is conveniently located in Dallas, Texas and serves all of the neighboring cities including Avalon, Balch Springs, Bardwell, Brandon, Cedar Hill, Corsicana, Crandall, Dallas, Desoto, Duncanville, Elmo, Ennis, Ferris, Forney, Forreston, Garland, Golden, Grand Prairie, Hutchins, Irene, Irving, Italy, Kaufman, Kemp, Lancaster, Maypearl, Mesquite, Midlothian, Milford, Palmer, Red Oak, Rockwall, Rosser, Scurry, Seagoville, Sunnyvale, Terrell, Waxahachie and Wilmer.